Role of Lexical Analyzer | The Daily Programmer '+g+"
if it thinks a lexeme constitutes an identifier, it stores that lexeme in that symbol table. to get the type of identifier for a particular lexeme so that it can generate more relevant token for the parser. 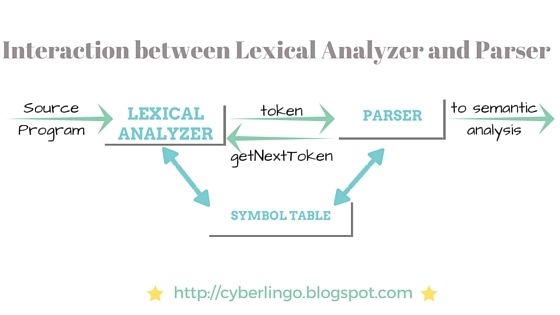 Interaction is actually implemented by parser when it calls getnexttoken, so that the lexical analyzer processes its input stream and identify next lexeme to generate the next token for parser. Lexical Analyzers also have a role in removing whitespace (newline, blanks, tabs), comments etc. They also associate error messages with corresponding lines (based on the newline characters or other delimiters) in source program. Scanning - no tokenization, only scanning - removing comments etc.